Share the crunch! 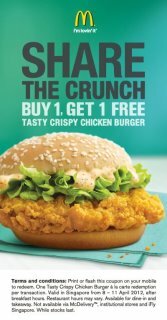 Buy one, get one FREE Tasty Crispy Chicken Burger. Simply flash this image and show to counter to enjoy meal. Print of flush this coupon on your mobile to redeem. One A-la-carte Tasty Crispy Chicken redemption per transaction. After breakfast hour in Singapore from 8 April- 11 April 2012. Available dine in and take away. Not available for McDelivery, institutional stores and iFly Singapore.